First- I didn't know I had so many friends in Cincinnati! We could have had a big blog lunch I guess! :-) I enjoyed your city!!! And this cutest thing ever all have to do with each other??? All possible parts of our family costumes for Halloween. Scott surprised me by saying he would dress up to match Harper's outfit. (That girl is so far wrapped around his finger it's silly) (or maybe it's just that he wants a lot of candy). I know it's 2 months away ........but I can't wait! Precious! Would have soooo been down for lunch too :D Next time! Awe...can't wait to see the that! I have started planning our Halloween costumes too! Yay!! Y'all are gonna be so stinkin' cute! oh my goodness how cute!!! i already have our kids costumes picked out and we aren't even pregnant or anything! that pig costume is just too too cute! We have started thinking about Halloween also! So fun, and it will be here in a flash. Too cute! Cant wait to see pics! I saw that costume yesterday in a catalog and thought it was ADORABLE! Good choice! I love your blog. It is what I look forward to each day! Thank you! Y'all are going to be so cute! What fun costumes!!! That is so adorable!! Where did you find that?? I would have loved to have met you in Cincy for lunch. I love the little piggy costume. TOO CUTE. 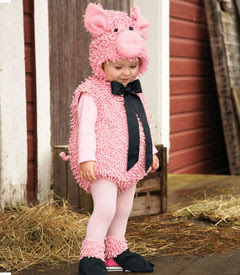 I just picked that pig out for Amelia to wear this Halloween a few days ago... is it not the cutest thing ever???!!! Harper will be REALLY cute in it too!! that is one CUTE little piggy! halloween will be here before we know it! that little piggy will have LOTS of treats! That is the CUTEST little piggy outfit! Do you think I can talk my almost 10 yr old daughter into wearing the pig costume?? That is THE cutest costume I've ever seen!!! Harper will be EDIBLE in it! Where did you find that one? I was looking at One Step Ahead last night, thinking about this very thing! I'm leaning toward the monkey, giraffe, or tiger (all of which would match favorite stuffed animals). If you're ever in Nashville, Kate and I would love to meet you and Harper! Old MacDonald? We are thinking costumes around here, too. 3 year old= witch, baby= black cat. That's what we all agreed on. Super cute...I can't wait til Halloween either. Last year was my daughters 1st halloween and I had such a hard time deciding that I actually had 2 outfits. One for pictures and the other was for trick-or-treating! Haha! Okay, so I have been looking at costumes too. I have been looking very seriously at a pig for Lauren. I wanted the two girls to match so the other idea I had was Rachel to be a clown (I found the cutest outfit ever) and Lauren a peanut! ha!!! We don't do ghosts, skeletons, anything scary and no witches for us! Can't wait to see pictures in her pig costume! Do tell where that cute piggie costume is from!!! My husband is the same with our girls and it's worse with the second because she's the caboose of the fam! girl, i'm a planner too! we started Christmas planning/shopping a few weeks ago. obviously, not an earth-shattering question. i was just curious! just if you happen to have time to answer one day in the future. awww that costume is super cute. we dressed our one year old up like a cow last year and hubby was the cowboy! too cute. Too stinking cute!! Especially being here in Arkansas. That is a cute piggy costume...I seen that in the same magazine I just bought Kelcee's bumble bee costume in... I think me and my husband (if I can talk him into it) are going to dress like beekeepers. I can't wait to see your halloween pics. So........ what is Harper going to be? Or is she going to be the piggy in the picture? I love Halloween! My Mom sews and she always put A LOT of thought into all of our costumes; there are seven of us kids so there was lots of sewing and thinking to do! My baby sister was Ms. Piggy one year and she was just adorable! Mr. and Mrs. Farmer and their piggy is a really cute idea! That is TOO CUTE, Kelly! I LOVE that pig costume! I am glad to know that I am not the only one who is already costume shopping..ha! I was a little shy to admit that I found Kinley's costume this week. She is going to be the Itsy Bitsy Spider! So fun. Totally can't believe we are already buying Halloween costumes for these girls! AH! Where do you get that pig costume? Too cute! NO WAY! CILLA IS GOING TO BE THE SAME LITTLE PIGGIE FOR HALLOWEEN!!! They really need to meet and be friends! I saw that pig outfit in a catalog a few days ago and LOVED it!!!! I was trying to decide if it was only for girls or if I could make Jeryn wear it! :) Ha! I decided he might not ever forgive me...but that is an adorable outift! i've been thinking about this holiday for a couple of months. next time your in cinci, go to graeters ice cream. you will not be disappointed!!! best ice cream evah! We have always dressed up as a family since Gage was small. By the way Halloween is my B-Day. I've been looking at cosumes today too! Landon's going to be a monkey! We are not dressing up to match..ha! Precious...where on earth did you find that pig costume?!?! What a great idea!! And good for you to think ahead, wow! Match while you can. We are in the princess phase and don't see my husband dressing as a prince. You still have control. Love it! Enjoy it while you can. It won't be long and she will want to be wearing the ugly polyester junk that falls apart before the night it over! What a cute piggy costume. Love it. I have had my kids halloween costumes since February, ha! Taylynn and Preston are going to the princess and frog prince. I love Halloween!!! cute outfits!! L*O*V*E the pig outfit! Absolutely precious!!! Scott will have to practice your best "soo-ee!" oh that little piggy costume is priceless!I have a little chicken costume going in my garage sale next weekend that would be perfect with the piggy! I loved it... 2 of my boys actually wore it but It never occured to me to have the whole family dress in related costumes... That may be an idea for this year- I LOVE halloween! Wow. That was everywhere. lol. I saw that sweet little pig outfit in my Firefly catalog yesterday! i love it. I'm thinking about the little chick for my little guy! Oh my goodness, this is the costume that I am putting Livi in this year! It was by far the cutest on chasing fireflies. Great minds think alike! Ok I have started looking for Harrison's costume too but haven't found anything nearly as cute! Please share where you found this one! I love reading your blog, you give me so many ideas! I have been planning my daughters 1st Halloween too and I was thinking you should do a Friday show us you Halloween costumes so that we could get some cute ideas! I bet some other moms would like that too! How cute! 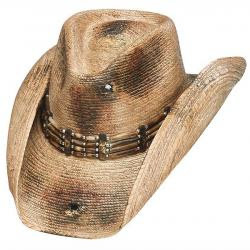 Now, please tell me Scott will wear a hat that doesn't have bullet holes....LOL! OMG!!! I love that pig outfit! Seriously! Here is what you can do! Buy the pig outfit for Harper. Then, if I end up having a girl (find out next week!) you can sell it to me for next year!!! I LOVE the little piggy costume, she is going to look SO cute! I live in Ohio too! Not Cinci, but that's so fun that you were in our State. That pig costume is simply TOO much! So cute. Sophia is almost 5 and always has a new idea for what she'll dress up as. Riley will get to wear a zebra costume that his sister wore for her first halloween! I can't wait to see him in it. So glad flying with Harper went well. Isn't it fun taking our kids on little adventures?? I love experiencing life with my kiddos. We did a lamb on Garrett last year and he was the cutest! Harper will look super cute in the piggy costume! Better take extra pillow cases for all the candy!!! oh oh where did you find that last costume? I LOVE IT! We're working on Halloween costumes too! It's never too early and I myself, have been looking as well! Can't wait to see ya'll in your costumes! I LOVE the little pig outfit! I had my kids' Halloween costumes picked out before I knew I was even pregnant with the second baby...more than a year ago...I have 2 girls, ages 2 and 5 months and they are going to be little bo peep and a sheep... Dressing up kids is fun! That would be so cute if y'all dressed alike! And how stinking cute is that little costume for Harper!?!! I just did a post about Halloween costumes too! I am sure you are having just as much fun planning Harper's first Halloween as I am having planing A's first Halloween! HAHA my little one said she wanted that costume too! So funny! I wanted her to pick Little Bo Peep right above it! Kelly, the piggie costume is too cute. It's never too early to start planning. And if you're ordering from a catalog, you better order the day you see something or it's gone. Can't wait to see Scott in those ostrich skin boots and the hat! Once again, we are twins because last week I picked out Connor and Avery Kate's costumes! They are going to match, too! The first halloween after our first son was born we all dressed up as the 3 amigos...so cute. Kind of miss those days! Oh my goodness, that little piggy costume is ADORABLE!!! Great, now I am thinking about what to dress my 2 year old up as. Last year he was Mickey Mouse. Hmmm wonder if they make a Cookie costume (not cookie monster just a cookie)? That is SO precious!! Don't feel bad about planning ahead...I had my little girls first Halloween costume picked out when I found out I was having a girl...and bought it shortly after she was born (in December)! My little pink poodle was so stinkin cute, as I know your little piggie will be!! Did you find this costume at One Step Ahead? I cannot wait to see pictures of the two of them. I think you need to dress up, too! Y'all would be the cutest! Ahhhhh...that's what my daughter is going to wear for her 1st Halloween too! She is just a few weeks older than Harper:) Check out www.sensationalbeginnings.com for the cheapest price I've found!!! Kelly.. you've totally got to think ahead! I always buy costumes in September on EBAY! I get them for dollars and if you wait until October they are triple the cost! Check it out. Owen is going to be the Tinman from the Wizard of Oz. If I only had a heart... cause he's waiting for his new heart. Now I need to convince Kamryn to be Dorothy. Awww...that will be so cute! Kayla is going to be a lady bug and my mom agreed to make the costume like she did for me when I was little. First we have to make it through the 2nd birthday! YIKES! Oh my goodness. SO CUTE! Haha! I'm so glad that I'm not the only one who plans ahead. We just got the material to have matching pirate costumes for my two. I LOVE, LOVE that costume. CUTE! That pig costume is too cute!! I love Halloween and getting to dress up with my baby brother and sister. They are too fun!!! Happy Thursday!! So cute!!! I love it. Don't know what we will be this year, but I can't wait. Too cute!!! I came across your blog through Lianna's (she and I grew up together) and I absolutely love it. I look forward to reading it everyday!! Your daughter is adorable! No way. KELLY!!!! I have been looking for a pink pig costume for our little girl... I saw one on a blog a few months ago, and I cant find the blog anymore (it was one of those that i clicked on someone who commented on someone else, etc...)... Harper will be adorable if you choose the piggy! I am still searching for a really cute pig or maybe a big poofy pumpkin... pottery barn kids has a cute one of those! My niece, who was two at the time, wore that pig costume last year for Halloween and I can not begin to tell you how very cute she was in it!!! I gave you a blog award! Check out my blog! Awwwwwwwwwwww!!!! How adorable!!!! I am already costume shopping. We need to space things out a bit!!! With 3 kids with birthdays around Christmas.... that time of year gets pretty tight!! So, I am shopping EARLY!!! Lol!!! Thinking about Halloween is the same as thinking about cooler weather so I totally get looking ahead. If I remember correctly though last year was still fairly warm. The year before that was freezing. Never can tell where we live...I'm sure y'all will be super cute! Where did you find that costume?? I need one for Addison! I see everyone else wants to know where you got the boots and pig outfit too. Can you email me or put it on the blog? Love the pig costume. Could totally see my little girl in it too! I was eyeing up the pig costume too.... way too cute. I can tell you have been to Hobby Lobby lately. Talk about putting anyone in the mood for Fall if you step in there! It will be here before we know it. Don't feel bad, I've had our family costumes planned out since two days BEFORE last Halloween!! I have the same costume picked out for my daughter! It is soooo cute. She was a chicken her 1st st Halloween, a cow last Halloween and I thought a pig would help continue our farm animal theme! Looks like fun! I love the piggy costume. A. is going as Thomas teh train this year and daddy likes to dress scary to go with the front yard. Oh Girl!!! It is NOT too early to be planning Halloween! LOL!!! 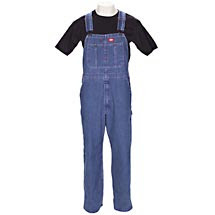 I have already bought an outfit for each of my kids for the pumpkin patch! :) I love the idea for your family costumes! Oh My Goodness, Where did you get Harpers Halloween costume? It is the cutest thing ever!! actually i am shocked you even do halloween...because of how christian you are,i thought for sure this holiday would not be an acception. (because of where it originates)your family is so beautiful and your daughter looks so happy all the time,i bet she will be as pretty as you when she is older. Love the little piggy costume. My girls always loved getting dressed up for Halloween. I made a lot of their costumes and that was so much fun!! Love & blessings from NC! I know you will probably do this, but google this costume. I have seen this in two different catalogs and one was twice as much as the other. Sorry I didn't keep the catalogs. Once I decided on a costume for my daughter, I threw them away so I wouldn't be tempted to waffle! Love, love, love this cotume! It was on our list but a ladybug won. I dressed her as a mouse last year so I wanted something with a tutu this year! She has three big brothers that all wore the mouse costume for their first Halloween, it was so cute. But, now it's time for tutus! That is one of the cutest costumes I have seen! Ahhh...to be that thin again! I will do it again...one day! PLEASE LORD! Oops...meant to leave that on the NYC post. Ha! I already talked to my littles about what they wanted to dress up as and they picked a coordinating theme! Fun! To add a little fun to the equation, Target always had VERY adorable dog costumes in farm animals. One of my dogs was a rooster last year and looked absolutely precious. Then the whole family would be involved!!! This is the most precious costume! I was going to order it for my daughter last year but it sold out QUICK!!! Then I could not find it anywhere else. So make sure you go ahead and put in your order! Ok, I saw this post yesterday and thought it was darling. And then in the middle of the night, when I was nursing my own baby it hit me... She'll be a "HOG"! Way WAY too cute! I giggled out loud. Too cute. We are going to be Old MacDonald, Mrs. Farmer, and either a chick or a pig. Kate's favorite song and book is Old MacDonald. She goes CRAZY at the zoo when we see the pigs!